Be nice to me I'm new! I had hair follicle simulation tattooing done by Andrea 2 weeks ago and thought that I would jump on the forum and give some feedback for others considering the same thing. A bit of background, I had a hair transplant done 8 years ago and it was ok initially and over about 18 months - 2 years I lost a lot of the transplant hairs and the balding continued to march onwards. Then 5 years ago I opted for a weave which I have worn since and over the last 2 years I have grown to despise the horrible thing that I had stuck to the top of my head. Each morning I would get up and look at myself in the mirror and feel like tearing that soggy perspiration filled smelly thing off of my head and flushing it down the toilet, I hated the tapes, the scalp irritation the maintenance costs and pretty much everything about it. I really wanted to loose the weave and go for a clipper cut but the thing that put me off was the donor scar, it was going to take enough guts to go au naturale without having to keep explaining the scar as well. Then I came across the option of cosmetic tattooing and after talking with Andrea decided to go ahead with it. I ditched the weave and had a clipper cut and immediately had both the scar tattooed and also a bit of extra on the crown on my head to thicken it a bit and as soon as she had done it I liked it so much I asked her to do some more around the front as well. What I like a lot is that unlike some of the pictures from the UK Andrea suggested to me that it looks more natural not to create a hard hair line and not to go too heavy because that is not how normal hair looks and she was spot on. After the tattooing I arranged a couple of days off work just to let the whole thing settle down and when I went back the first person who I ran into said hey great haircut Steve it really suits you, unprompted I got two more positive comments from people that day about the hairstyle. Apart from the wife I have not told anyone what I have had done, another family member said Steve I don't want to be personal but I notice the scar on your head has really faded away what have you done? It was the best decision I have made in years and rather than flushing the weave down the toilette I had a ritualistic burning on the BBQ while I sat and had a beer, I can't say how much I hated that thing. Particularly if you have donor scars it's a great option, check it out guys. I know that you have been offering the full head scalp tattooing for quite a long time and its pretty obvious that you pioneered this service in Australia but over the last year or so I have also come across a couple of services opening up. Have you actually trained anyone else in Australia in the scalp hair tattooing? If so who have you trained so that I know which ones are trained properly? Have you actually trained anyone else in Australia in the scalp hair tattooing? Hi Carl, welcome to the forum and thank you for your questions. Yes you are quite correct I have pioneered and have been perfecting the technique for this procedure in Australia, the short answer to your question is no I have not trained anyone else in scalp hair simulation and I am sorry I am not prepared to recommend another service provider in Australia for this particular procedure. I have seen the results of several full head scalp hair simulation tattoo services provided by alternative providers and they were simply not close to the results that I am achieving now, nor were they up to the standard that I have seen from a couple of the notable international locations providing this service. Unfortunately I have also been called upon to provide correction work for poor quality 'Full Head" scalp hair follicle tattooing provided here in Australia, as you can imagine it is a lengthy and painstaking process to try and correct thousands of oversized dots or dots of the wrong colour. Q: What is the background of the technician providing the work? I would ensure that the technician has been trained in paramedical tattooing and has at least 5 years of full time general cosmetic and paramedical tattooing experience. I would show a strong preference for a technician who provides a range of paramedical tattooing services as they are likely to have a broader range of experience and skills than one trick pony type services. Q: What equipment is the technician using to provide the service? In my opinion there is no question that the device of choice is the Amiea Linelle Supreme digital machine. A rotary pen simply does not provide the same quality of result for this type of procedure and the other digital devices I have used are not as good as the Linelle Supreme. If the technician cares about the result for the client they will use the best equipment. Q: What pigment is the technician using to provide the service? If the technician does not openly disclose the brand of pigment that they are using its probably a cheap brand. Some cosmetic tattooists will try to promote their choice of pigments purely on the basis that they are purchased from the USA, however in my experience there are some good brands and some not so good brands from the USA. By far the best pigments that I have encountered are the Amiea pigments, Amiea are manufactured in Germany, I don't know of another brand that manufactures to the same quality as Amiea. Some cosmetic tattooists will promote the fact that their chosen pigments are "FDA approved", this is quite deceptive because the FDA do not actually approve tattoo pigments they only approve the use of certain chemicals and pigments to be used in cosmetics. Tattoo pigments are lumped under the USA definition of 'cosmetics' so certain chemicals and colour additives that are approved by the FDA for use in cosmetics intended to be applied to the skin surface end up being used in tattoo pigments. Some pigments may not even be sterile! For this reason I would recommend that the pigments being used for your paramedical procedure are Amiea German manufacturing standard pigments. Q: What hygiene standard is the technician using to provide the service? Most cosmetic tattooist are providing services at a similar hygiene standard to a body art tattooist which is the minimum standard accepted by their local health inspectorates. Paramedical services such as scalp hair follicle tattooing should be aiming for clinical standards during your procedure, if the service provider claims that they are providing clinical standards ask what training was provided to them for them to be able to provide those standards and who was the registered health practitioner who provided their training? Q: Does the service provider have an 'on site' Registered Health Practitioner present during your procedure? Many service providers do not have any registered health practitioner on staff or they might perhaps have a GP pop in for a few hours a week to provide botox injections etc. However this is not the same as having a supervising health professional on site during your procedure. If there is an on site Registered Health Practitioner that should provide you confidence that the hygiene and safety standards are being supervised by someone who is properly qualified, you also have the peace of mind of knowing that they are on hand and can be called upon at any time if required. Q: Is the technician publishing client photographs on the internet? Placing photos on the Internet might be a way for a new service to drum up a bit of business but it is not a particularly nice way to treat your clients. I find overwhelmingly that men who have scalp hair follicle tattooing done are concerned about their privacy, most prefer it if others do not know they have had the procedure and whilst some are happy to have their photos shown to other clients most do not want their pictures placed on the Internet on a publicly viewable site. If the service provider cares more about drumming up new business than they do about the privacy of their clients then their services are probably not in very high demand. Q: What kind of procedure chair is the technician using? 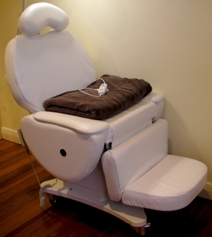 Most scalp hair follicle procedures will take several hours for each treatment so you want to make sure that you will be seated on a comfortable chair during the procedure. If the technician is using a cheap massage table rather than a high quality electric chair then you will be very uncomfortable for several hours and the technician obviously does not care. Q: Is the technician offering cheap services? Many corrective tattoo procedures that I have ever been called upon to provide to a client were due to them opting for a cheap procedure. If the technician is offering noticeably cheap services it is most likely because they are inexperienced or because their work is of a poor quality. Q: Is the technician performing test patches before providing full head scalp tattooing? I consider a test patch essential before providing this service and I would regard it to be unethical not to perform one first. If the technician is not performing a test patch before the procedure then its a fair indication they have not been properly trained in this technique. Who would want to end up with a full head of hair follicles in completely the wrong colour? Q: Are there any flashy marketing or high pressure techniques being used? Of all the forms of cosmetic and Paramedical Tattooing I think that clients who request scalp hair follicle tattooing are the ones who need to be the most confident that the the procedure is right for them. Sometimes after an initial consultation I will insist that the client take some time to consider the procedure and perhaps talk it over with friends and family. You should never feel under pressure or subjected to flashy marketing in order to get you to proceed with this type of service. Scalp MicroPigmentation More Than Just Ugly Scars? Q: Is the technician providing your service an accredited workplace trainer? Those accredited to provide training services are more likely to be constantly improving their skills, ask if the technician is an accredited workplace trainer and what they are currently doing to increase their skill set? Q: Is the technician making any false claims about the procedure? For example you will need touch ups every few years to keep the tattoo looking optimal, making claims that it wont require or might not ever require a touch up is just misleading you, of course scalp hair follicle tattooing will tend to fade over time. You should also be careful about the independence of comparative reviews sites as some are being paid to advertise the services that they provide positive reviews on. If you think you are being misled then feel free to give me a call to ask any question you might have about this type of tattooing. I hope this list helps! © Andrea Darby from CosmeticTattooist.com all rights reserved, no unauthorised copying or reproduction permitted. Andrea thanks for providing such a comprehensive answer, this has helped me a great deal. I have spoken to a couple of places who were quite cagey about what brand of pigments they use, like as if its a trade secret or something what BS if they were using the best brand then they would have no problem advertising what they use. I definitely get it, the whole FDA approved thing is a bit meaningless because that just means cosmetics quality it def sounds like the german pigments are the best. I take on board everything that you have said it all makes perfect sense and it seems to me as if some are trying to offer this without really knowing what they are doing and they are tying to do it with cheap supplies and equipment too. Thanks again I appreciate how open and honest you have been. Thanks for letting me join the site, i have a few questions on scalp tattooing i would like to ask. Firstly if i look at photos on the website of ####### to get some ideas of how it all works, would that be correct to assume it's the exact same as what you do? As I'm from Tassie i'm just wondering what the first step would be if i need to fly to Melbourne to meet you or can it be done by photos? And also wondering what other steps are there in getting the procedue done and then how long are you looking at to you can get an appointment to have the procedure done? Thanks for letting me join the site, i have a few questions on scalp tattooing i would like to ask. Firstly if i look at photos on the website of ###### to get some ideas of how it all works, would that be correct to assume it's the exact same as what you do? Welcome to the forum JMF, we have had a lot of spammers hitting the site so I had to tighten up the permissions for the free email providers domains so that the forum was not over run, thanks you for your patience and for requesting approval for your email address. I have removed the name of the business you mentioned to avoid any potential for conflict. I am not familiar with the business that you have mentioned they seem to be a very new service because the site registration appears to be only just over 12 months old (04/11/2010) Link for Registration details. I have been providing partial and full head hair follicle simulation services and developing and improving the technique a lot longer than that! As I'm from Tassie i'm just wondering what the first step would be if i need to fly to Melbourne to meet you or can it be done by photos? You can send me some photos via email (make sure they are clear and in focus) and I can discuss with you what you would like to achieve and the estimated cost range for each treatment. The exact cost per treatment is provided at your first appointment and to get the best results most will require at least 2-3 treatments in order to layer the simulated hair follicles to the required density. And also wondering what other steps are there in getting the procedure done and then how long are you looking at to you can get an appointment to have the procedure done? The first step is the initial consultation and if you and I are happy to proceed then a test patch is performed to a small area which is reviewed in 4 weeks time, if we are both happy with the results of the test patch then your first treatment can then be provided. The reason for the test patch is to attempt to colour match as close as possible to the natural hair follicles, colour changes do occur during the healing process so its an essential step. I am generally booked out at least 4-6 weeks in advance, you will find that anyone who is good at what they do in this industry usually has high demand for their services. I am sometimes able to book people in if someone changes their appointment but usually it is for shorter appointments so I might be able to fit you in sooner for the initial consultation and test patch but expect to book in advance for the procedure as in most instances it will take several hours. Thanks for answering all the questions for me, it has really helped i will email you some photos through in the next coulple of days and hopefully be able to get the ball rolling. After 5 years of research and the review of over 200 scientific and clinical publications we have now put the finishing touches to our comprehensive course in SHFST™ with 60 hours of theory delivered via our CT-AIVEP™ online multimedia platform and 40 hours of hands on practical training. The course was developed in conjunction with a Registered Health Practitioner and is intended for experienced Cosmetic Tattooists, ParaMedical Tattooists, Medical Tattooists and health professionals. We confidently say that this is the most comprehensive course available in SHFST™ internationally. Caution: There are some providers offering this service with no medical tattooing background and sometimes even limited cosmetic tattoo experience, don't be taken in by flashy websites or unsupported claims. Andrea was invited to attend as a Master Lecturer at "Permanent International" the global congress on Cosmetic Tattooing in Berlin 03-11-2012 in recognition of her work in SHFST™. I suggest that you make sure that you read the article on the link below. I have been looking around at different websites and I notice that some places say they only use true black pigments and do not use pigments with blue in them and one website ######## said to be careful because permanent makeup artists use indian ink and unsuitable pigments etc can you explain this a bit better for me.